My Gramps is down with bad knee trouble, to the point where he cannot walk. It has been going on for a month now and he has been stubborn about not investigating it, so I will be dragging him to doctors and tests from tomorrow. I've managed to forget my camera, so you'll have to make do with iPhone photos until Gramps gets a clean bill of health. Over the last month, I have been diligent about hair care - I underwent a grand chop, donating 19'' of my locks, back in September. My hair is a lot healthier, and easier to manage. And, hair care products take longer to use up. I wish that was true with skincare - my skin seems to guzzle up product. Scroll down for more on the beauty products I used up in November 2016. If you have any kind of skin trouble - dryness/flaking, spots, pigmentation, lines, scars... you need this miracle. 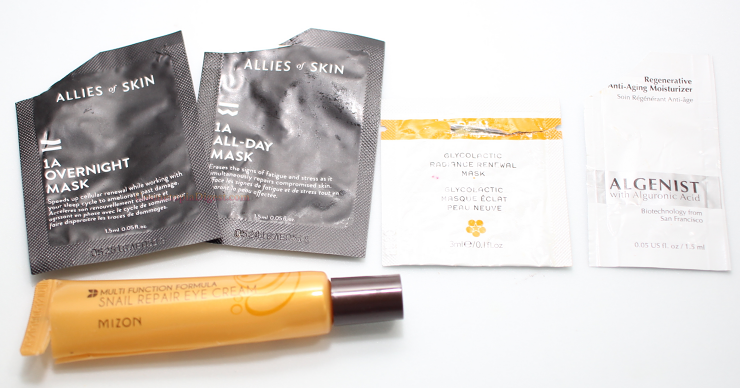 I went straight back and bought the full-sized tube after one use of the sachet (I got two sachets as a gift with purchase back in August). Each sachet is good for two uses - apply overnight and wake up to far better skin in the morning. Repurchase? Done, and I'm almost finished the tube I bought a few months ago. Unfortunately, this has become out of stock - I'm not surprised. The daytime companion to the above. Very nourishing and hydrating. Makes a great base for thicker makeup such as Kevyn Aucoin's Sensual Skin Enhancer. Repurchase? Currently out of stock. Argh! Reviewed here. 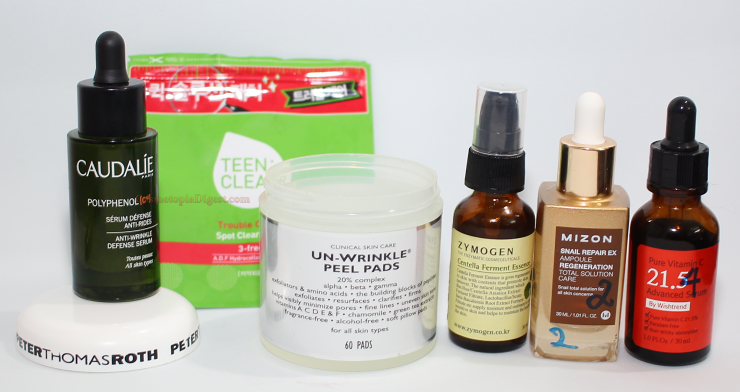 A 15-20 minute peel that provides chemical exfoliation in a jiffy. Don't follow up with a strong acid pad, but go for a hydrating toner or serum afterwards. It took me a while to warm to Algenist's range, and now I love the Repairing Oil. This didn't wow me as much as the oil did, but it is a solid, rich moisturiser for the Winter. I LOVE Mizon's Snail All-in-One Cream and the Intensive Repair Ampoule. And the Snail Repair Perfect Cream and Sleeping Pack. Sorry, ya'll. It PILLED on me. And I woke up with very dry under-eyes. I finished the tube on my elbows - it pilled even there. Whyyyy would a brand produce an amazing range of 5-6 products, with one God-awful product? A lightweight, quick-sinking serum for the mornings, when you have to wear makeup. Repurchase? After making a dent in my serum stash. Hydrocolloidal plasters, to be used when you have a popped/ruptured pimple. These are okay; they flatten the ruptured spot. But I feel CosRx's hydrocolloidal plaster does a better job at healing the spot overnight. This one pulls at the skin when you remove it. I cut these in half, so they lasted four months. These make good, reasonably-strong-but-not-harsh pads for daily use. If you have an ongoing breakout, this is the range to reach for. It works better than most spot treatments. Strong stuff. Repurchase? I only use this during a breakout, and have enough to last me a while. My favourite snail product. Repairs, soothes and hydrates the skin beautifully. Mizon and CosRx have stated that they do not harm the snails, so those are the brands I prefer. Repurchase? I have four bottles or so, I think. I thought I would never love a Vitamin C as much as I loved OST's C20. Wrong! I love this far, far more! I'll never be without it again. It is 21.5% L-Ascorbic Acid - strong stuff, if you don't build up to it - and needs refrigeration. A bottle lasts me about a month, now that I use this two times a day. I prefer cleansing conditioners to regular shampoo, except once a month or so when I attack product build-up. This was richer and thicker than Wen. If you prefer lighter CO-washes, go for Wen. If you like em rich and nourishing, go for this - especially if you have thick, curly locks. Repurchase? Not until I use up a bunch of CO-washes. I got this in a Memebox and forgot all about it until I was "autumn-cleaning" my hair care stash. You apply the serum first, and then seal it all in with a cap, before washing the lot off. Repurchase? No. Too much of a hassle for me. I'm loving how rich and nourishing Ouai masques are. These have helped ease my transition to short hair. Repurchase? Once I go through a few other hair masks. It takes me ages to use up shampoo, because I only use it to remove product build-up, and prefer CO-washing. This wasn't anything special. Did the clarifying job. Repurchase? No. 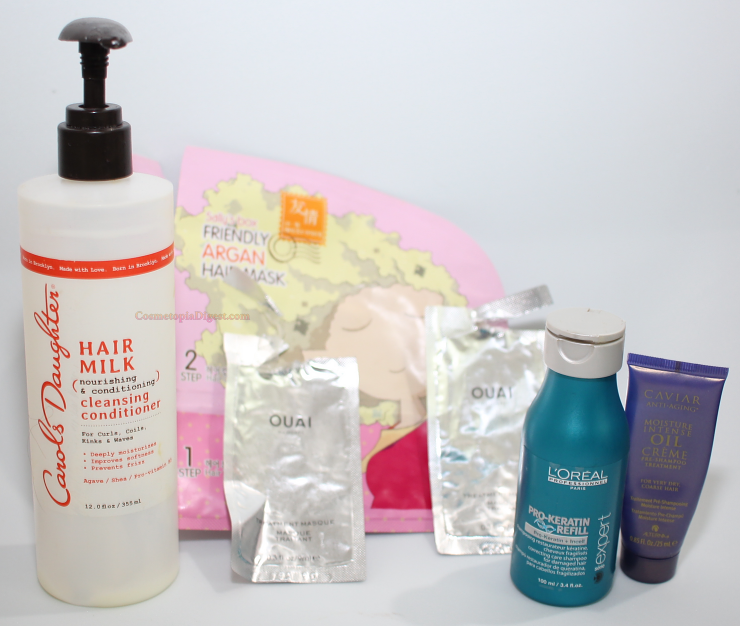 Shampoos from beauty boxes will keep me going. A pre-shampooing treatment. I prefer intensive treatment before washing, since post-wash treatments usually make my hair greasy. This did a nice job of softening my hair. Repurchase? Probably. I need to think about it. Finished any beauty products? 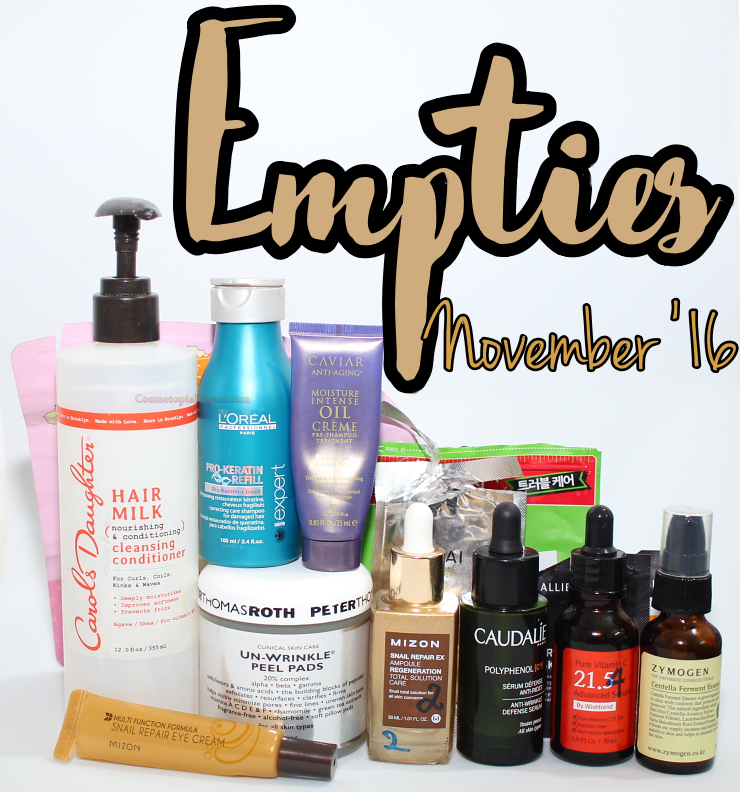 Link up your empties post here - open till December 10! Get the code here for your blog. Check out other beauty posts this week here.